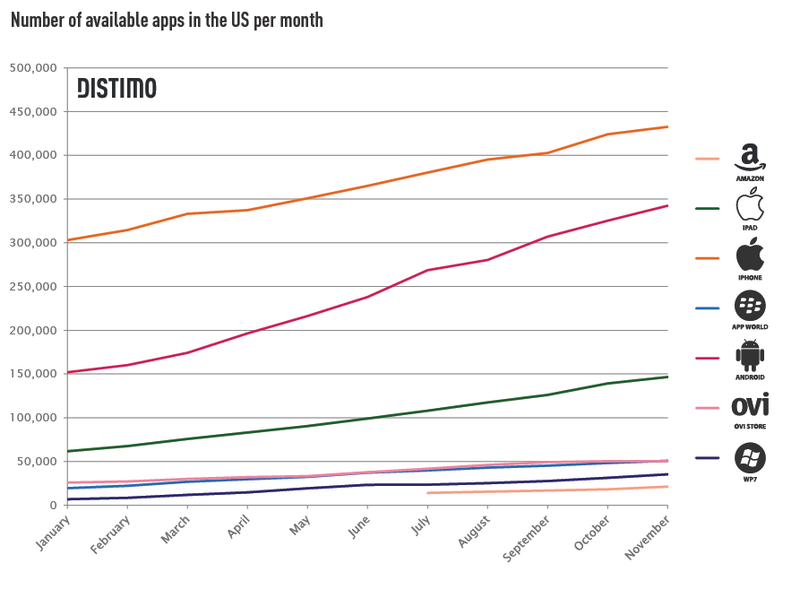 There are now over a million mobile applications available across the top seven major app stores, according to mobile analytics firm Distimo in its year-end report for 2011. And, not surprisingly, the iTunes App Store is still the one to beat, especially if you’re a developer looking to make a profit. These figures are all that more impressive, considering the dramatic increases in apps using freemium business models as well as free apps supported by in-app purchases. 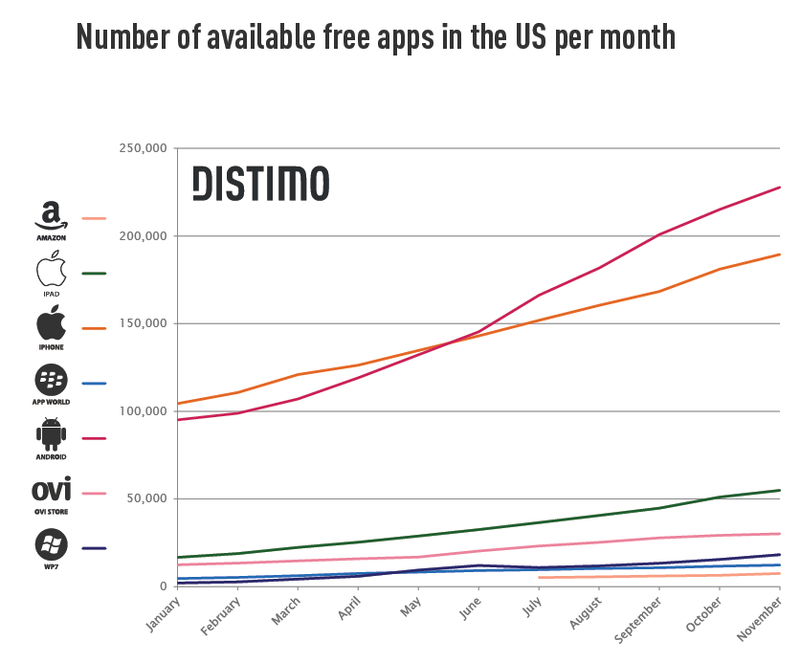 Half of the revenue of the 200 top grossing apps are now freemium apps in the iPhone App Store, says Distimo . In the Android Market, that figure is even higher: 65% are freemium. On the iPhone, the number of apps using the freemium model went from 29% in January to 53% in September, then fell slightly over the next two months. The firm also suggested that Android developers switch from a one-off fee paid monetization model to freemium, at least for those developers targeting the U.S market. The stores themselves have seen massive growth over the course of 2011, with all stores except for the App Store for iPhone, having at least doubled in size. Microsoft’s new store for Windows Phone grew quite a bit – 400% – and closes the year out with 35,269 apps available as of the end of November. However, the general order of the stores ranked by size has remained constant during 2011: iPhone, Android, iPad are the top three. The only change involves BlackBerry App World, which is now just slightly larger than the Nokia Ovi Store in the U.S.
Games are the largest category of apps, and generate the most downloads. On iPhone, there are 79,077 games; on Android, there are 46,045; and on iPad, there are 28,683 games available. Windows Phone comes in fourth, beating out BlackBerry and Nokia as the next largest store for games, and Amazon’s Appstore follows it. 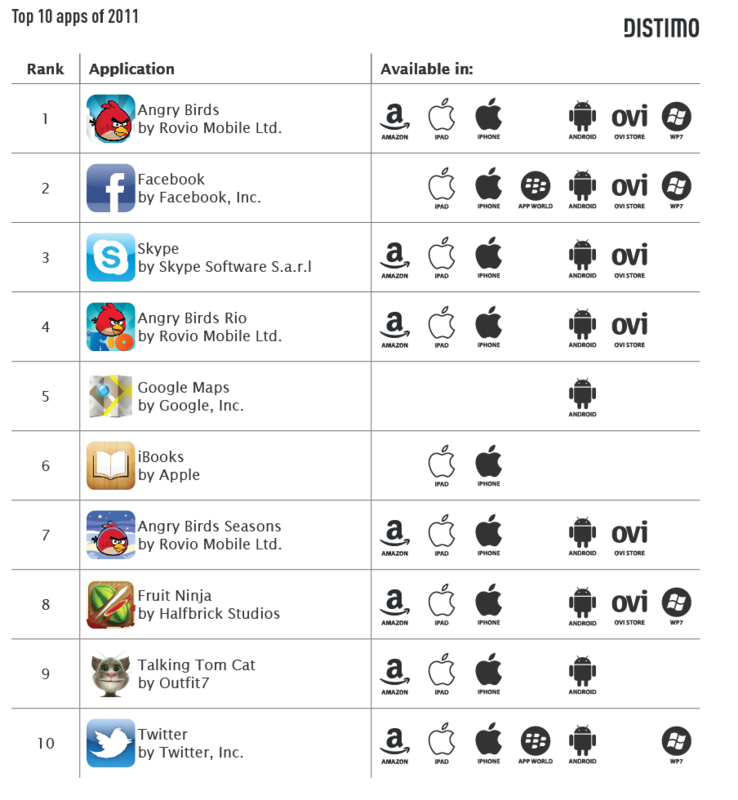 While all of the above figures pertain to the U.S. market, the company did note that the U.S. is no longer the single most important country for apps. In January, China generated only 18% of the downloads when comparing the U.S. iPhone App Store together with China’s. By November, it was generating 30% of the combined total downloads. And on the iPad, the two stores are almost equal in size in terms of downloads. 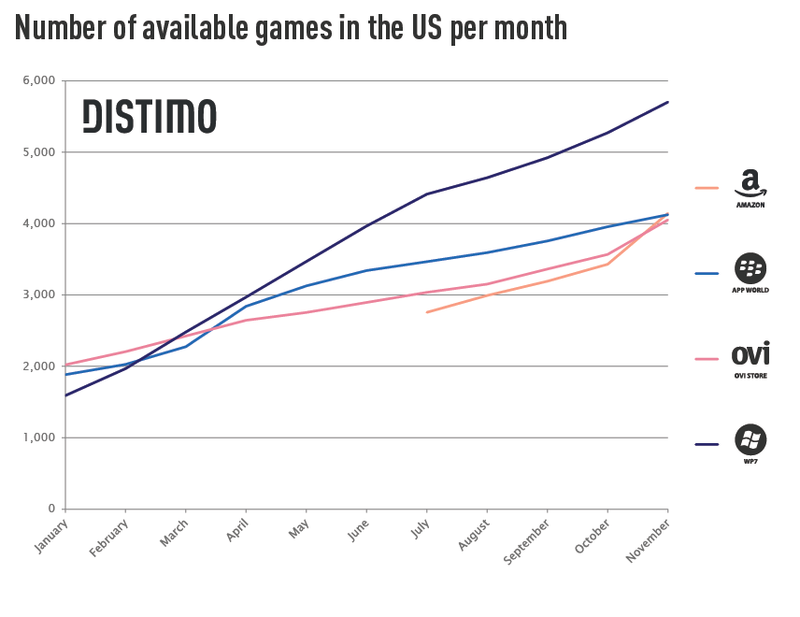 Distimo has a paid report that delves further into this and other regional trends in more detail. Following that, in order, are: Facebook, Skype, Angry Birds Rio, Google Maps, iBooks, Angry Birds Seasons, Fruit Ninja, Talking Tom Cat and Twitter.